Cozy café in the old town hall. Relax with a good cup of coffee together with something homemade. At the same time you can enjoy the art exhibit on the walls. 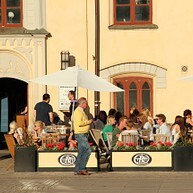 In the summertime you can sit outside and enjoy the evening sun. This café is located at a community center in a beautiful country side environment. Here you can enjoy berry pies, waffles, pain riche with filling, grilled sandwiches and different pastries. If you are allergic you can have gluten-, lactose- and sugar free pastries as well. 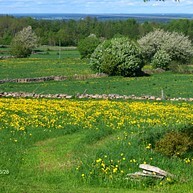 Open from 1st May to 30th June during Sundays, and selected weekdays. This traditional patisserie with a well thought out 1950’s theme is located in Tidan just outside Skövde. This unique place has guests from far away that come to enjoy the great cakes and cookies and to experience the atmosphere. 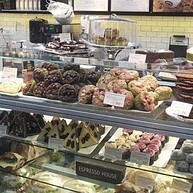 You can also order cakes, pastries and the Swedish specialty “sandwich cake”. 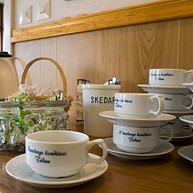 At Café Prostgården you can have a nice cup of coffee together with a sandwich or homemade cookies and pastries. There are also gluten-, lactose- and sugar free alternatives. The café also sells cookbooks. 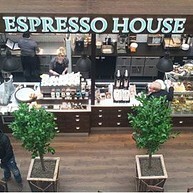 Right in the middle of the travel hub Resecentrum, Espresso House offers an oasis. Here, you can order a great cup of coffee on the go or sit down to enjoy the comfortable environment and enjoy your coffee as well as a range of baked goods. Take a break from the shopping and sit down and let yourself be carried away by the smell of freshly brewed coffee, just-out-of-the-oven scones and other irresistible homemade cakes and biscuits.